An experience of a lifetime!! This is the total vacation package to meet everyone's needs. 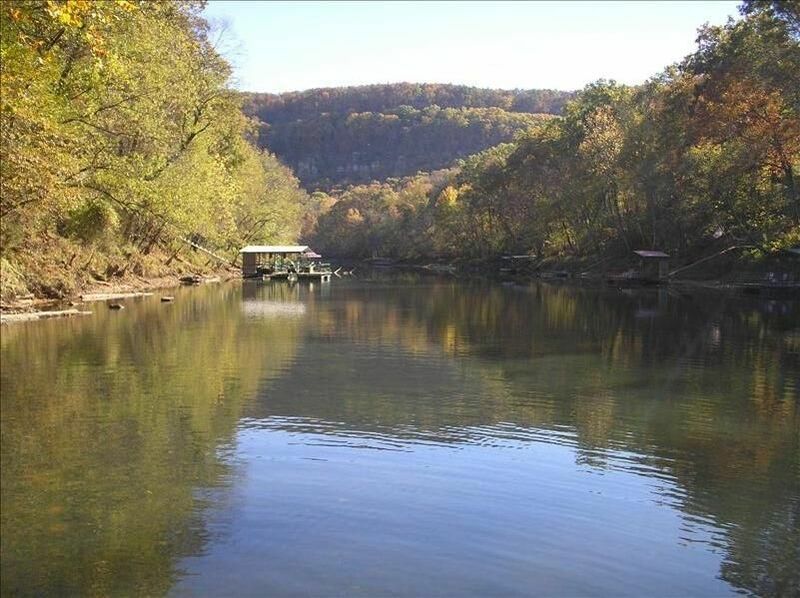 Completely Private, secluded retreat located DIRECTLY on the banks of the Little Red River in the beautiful Ozarks of Heber Springs, Arkansas. This Fully-furnished HOUSE is only 5-minutes from downtown, nestled on 2.5 Private acres. This split-level House is perfect for single couple or 2-3 couples/large family, offering a Spacious 1850-SQ FT., 3-Bedroom, 2-FULL baths with spacious open floor plan, perfect for entertaining. Large, open Living/Kitchen area surrounded by Anderson crank-out windows, allowing beautiful views of river, wildlife and natural surroundings. Every room is luxuriously-furnished & decorated. Three Queen-size beds with luxury, 1000-thread count Egyptian bedding. Two FULL-size baths equipped with luxury towels and all the necessities. As you enter the Kitchen be sure to enjoy Bridget's Homemade Signature Muffins upon your arrival!! The kitchen is very spacious with an open floor plan and completely equipped with ALL the amenities of home (Upscale Cookware, cooking utensils, several high-end Appliances, 8-Piece dinnerware, etc.). Enjoy free INTERNET/WIFI, cable TV/DVD with fully stocked DVD library or play Wii on the wall-mounted 42-in flat screen HDTV. Entertainment area is fully equipped with board games, card games, for all ages and tons of various reading material. PET FRIENDLY!! Your doggies' needs are provided as well with dog bedding, blankets, serving food and water bowls, leash and even chew toys. NEW added feature is 10-ft x 10-ft secure Dog Kennel with Igloo dog house located near house for those occasions where you may like to secure your dog outside on a nice day while you go down to the river or out for shopping/dining. I strived to create a luxury, up-scale atmosphere, anticipating and meeting everyone's needs yet comfortable enough to relax and enjoy. Backyard has 194-ft of river frontage with multi-level decks overlooking the river, leading to new, upscale 16 x 40-ft private dock/Partially covered. Wade fishing off dock with short walk to shoals, home to rainbows and browns. Enjoy the spectacular, scenic views of rock bluffs from the river dock. Comfortable seating available on all levels of the dock. This House with detached shop sits 75-yds off the street with large front yard allowing ample parking for boats/trailers as well as room for children to play. This retreat is located in the private, exclusive Wildflower Subdivision in Heber Springs, sitting at the very end of the street, further enhancing your privacy with the closest neighbor being 150-yds. Your pets can roam the property at leisure with very minimum to no traffic or neighbors. The natural scenery is enriched with breath-taking views & abundant wildlife. You can watch the Canada Geese smoothly land on the lake or feed the ducks. The roads are paved with minimum traffic, allowing for leisure nature walks or bike riding. Little Red River Retreat, LLC is proud member of Heber Springs Area Chamber of Commerce. Little Red River offers 29-miles of ideal trout habitat below Greers Ferry Dam. These waters are home to world record brown trout. Full service marinas and guide services available. Greers Ferry Lake totaling 32,500 acres of clear water is located just minutes away, offering recreational use for the water enthusiast. Full service marinas providing boating rentals available. Attractions in the area include hiking trails, rock climbing, breath-taking overlook views, trout hatchery, boating, fishing, swimming, dining, shopping, antiques, shop/visit Aromatique Headquarters, Community Fitness Center offering swimming pool, walking track, fitness equipment with day passes available, golf. Please contact me regarding special requests for Pet Friendly accommodations. Can Assist you with Reputable Fly/Bait Fishing Guides from the Neighborhood. Member of Heber Springs Area Chamber of Commerce. This property is one of a kind for ultimate privacy, located at end of road located in upscale yet restricted subdivision, offering minimum to no traffic. Only few minutes from downtown Heber Springs yet you feel like you're in your own state park. This Spacious, open floor plan, 1850-sq-ft House with 3 Full-Size Bedrooms and 2 Full-Size baths is like walking into your home, all your needs have been anticipated! Bathroom 1: Full-size bathrooom with bathtub/shower Bathroom 2: Master with double vanity, walk-in shower; 7-ft shower head. Each equipped with all the amenities of home. Beautiful views of the Little Red River from the formal dining, living room, bedroom and outside decks. 1000-Thread Count luxury Egyptian sheets on all beds; abundant pillows and throws. Cabin is located at the very end of a dead-end road, sitting 75-yards off street with large front yard, circular drive allowing ample parking for boats/trailers. Luxury Egyptian Bath towels, hand towels; facial clothes provided for makeup removal. Ample steps leading to and from the river dock to get a decent cardio and fitness work out. Neighborhood pristine setting for walks, bikes and jogging. Outside games provided. 2 Mt Bikes provided. firewood provided for wood stove; firewood provided. Spacious, Open Floor Plan; Large windows surrounding living room-views from all angles. Plenty of seating-upscale leather couch; Lane suede recliner, rocking chair, 4 viewing chairs, built in shelves. Fully stocked! High End dinnerware; service for 8. Formal dining seats 6; bar seats 2; booster seat provided. Picture windows surrounding the formal dining overlooking the river. Large Variety of books, magazines, reading material. Renter's welcome journal available, providing various informative information to make the most of your stay. Multiple board games, puzzles, card games, poker tokens, etc. Small children's building blocks and toys. Items for all ages. Children's building blocks, Toddler toys, etc. Infant's bouncer; stroller, 3-wheeled all terrain stroller. Added feature is 10-ft x10-ft DOG KENNEL for those occasions you may like to secure your dog on a nice day while you go down to the river or out for shopping/dining. Multiple level decks with ample sitting on every level. Smoker's Ash receptacle located main deck. Lighting on every level. The setup was exactly what we wanted, large outdoor areas, river access, and secluded. Being the very last house on the street also removed any traffic noise though there are not many cars anyway. When we were there they were letting a lot of water out of the dam and the sound of the river was so peaceful we even slept on the dock one night! The place is stocked with everything to help you enjoy your stay and make it feel like home. I would definitely recommend this house and host. We really enjoyed our stay at Bridget’s river house! Everything was perfect. The dock was great! Can’t wait to make it back again! Great place for a relaxing get away. House has great view of the Little Red River and is very nice inside. Decking and dock are great to trout fish or relax to the sound of the river. Bridget has the house well stocked with everything you need for your stay expect food. We look forward to staying again in the future. The Little Red Retreat is an awesome place and Bridget went above and beyond to make our stay a wonderful experience. We thoroughly enjoyed our stay and are already looking forward to another trip this spring. Thank you, Doug! Loved having you as guests at the Little Red River Retreat and looking forward to the opportunity of hosting you and your family in the future! We had an incredible time at this home in Heber Springs. The home is so comfortable and completely stocked with everything you might need. The house is right on the Little Red River. We loved just walking out the door, down the steps and enjoying the peace and quiet on the dock. Bridget is the best and most welcoming host, including all of the treats she left for us on the kitchen counter. We absolutely know we will stay there many more times in the future. I highly recommend this house for fly fishing enthusiast and family getaways. Thank you, Dan for your amazing review. I’m delighted you and your family shared your Christmas holiday at the Little Red River Retreat. Looking forward to hosting you guys in the future! We loved our stay and Bridget was a wonderful hostess! Perfect size and location. Excellent amenities. Amazing view of the river and the bluff. We will definitely return again!!! Can assist you with Reputable Fly/Bait Fishing Guides in our very own Neighborhood. Please contact us regarding special requests for Pet Friendly accommodations. $225/per night with 3-Night Minimum stay (Exceptions to 3-night minimum stay possible during Off Season per Owner's Approval); 3-Night minimum All Holidays. Weekly Rate/discount-->Stay 6 Nights get 7th FREE!! (NOT to include TWO weekends!!). $125 Cleaning Fee (Non-Refundable). $300 Security Deposit-(This security deposit is Refunded upon Departure Pending No Damage). Pet Fee $25 per dog with 2-dog limit. Check In: 3pm-Check Out: 11am. 6-Person Limit-exceptions allowed only with approval Owner with additional fee. Minimum Age of 25 Required for Reservation. Cancellation Policy: Full Refund when canceled with minimum of 30-days prior to check in. Cancellation Processing Fee of $50 may be applied, pending Owner's discretion. Accept personal checks, paypal and on-line bookings. CONSISTENTLY RECEIVE 5-STAR-RATING REVIEWS!!! Proud member of the Heber Springs Area Chamber of Commerce.